street vendor, originally uploaded by tama-chan. 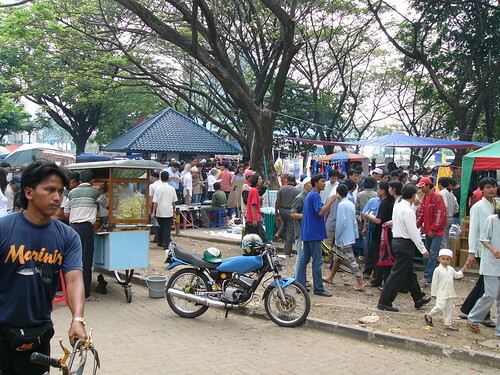 The street vendors are commonly found in Jakarta and other cities in developing countries. They are informal sector and an important part of the economy of the city. The informal sector in Indonesia in 2004 accounted for 64 per cent of the total employment. The proportion of informal sector in urban areas was even higher during the economic crisis in the late 1990s when the closure of many manufacturing and service corporations pushed the newly unemployed into informal sector. Increasing informal labor force is a distinctive characteristic of Jakarta and other cities in Indonesia since sector formal can not accommodate the large number of labor force. The informal sector is not only associated with the poor people but also with the middle-class people. 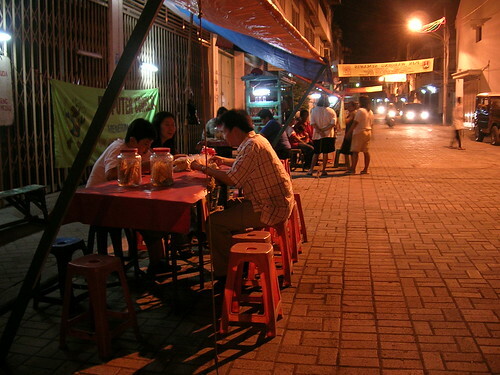 Many middle-class people in urban areas in Jakarta greatly benefit from economic activities carried out outside the formal sectors. Despite the contribution of the street vendors to the economy of the city, the existence of the street vendors are often seen as eye-sores and undesirable activities. There were a lot of conflicts between urban authorities who were trying to keep their cities clean and the street vendors who need space for their activities. In many cases, the urban authorities forcibly evicted the street vendors in the name of urban order and cleanliness. The street vendors need to play hide and seek with the authorities. In many cases, they can hide from the authorities by paying illegal levies to the thugs who regularly trawl the street vendors. The authorities should have known such illegal levies but they never touch the thugs. Nurbani (not her real name), who has been a footwear vendor since 2004, told The Jakarta Post on Wednesday (May 2, 2007) that she was forced to pay Rp 3,000 (US 30 cents) a day and an additional Rp 20,000 (US$ 2.20) a month to a group that calls itself the Kebayoran Lama Market Association. "They use scare tactics like sending drunkards over to non-compliant traders. As a woman fearing for her safety, I have no choice but to meet their demands whatever the amount is," she said, adding that the market authority did nothing to help. Fruit-seller couple Junaedi and Sriyani, who started their roadside kiosk in 1982, said they have been paying illegal levies -- which are claimed to be security and cleaning fees -- to the thugs who regularly trawl the market since they first set up their stall. They pay between Rp 500 and Rp 1,000 per day. Daleman, an official from the PD Pasar Jaya city market authority, said the authority's jurisdiction did not cover the area where the alleged extortion took place. Azas Tigor Nainggolan, chairman of the Jakarta Residents' Forum (Fakta), told the Post the extortion was a well-organized affair. He also alleged the market authority may be involved. This is only one of many other point of views of the complexity of managing informal sector in Jakarta. The informal sector plays an important role in the economy of the city but their existence is often seen as enemy of the city. Rather than receiving assistance and protection from the authorities, the informal sectors were exploited and evicted. Kaki Lima... after Jum'atan, originally uploaded by Ichang. The other day in Bandung, I interviewed a PKL and was surprised by how little he worries about thugs, fees, and theft. The man, who sells car stereos, pays only 15,000 RP per month: a fee which includes electricity and money for the satpol pp. Every night he has no fear packing up his stereos (worth 1500 dollars US!) on two bicycle rickshaws. This comment is in no way to diminish the real presence of thuggery that PKL's face, but I was struck that the preman haven't done more to extract monies from the PKL. Although your article is not about safety of pedestrians, but on the same issue of safety and security. One very important requirement for real urbanization that promotes the use of public transport and walking in a pedestrian friendly environment to thrive is public safety and security. On a recent project a developer in Indonesia told me Indonesian people do not walk, but I pointed out to him if you go to Orchard road in Singapore, you can see many Indonesians walking! The issue why they don't walk is because its not pedestrian friendly and safe! Lots of the current reasons Jakarta's development are so suburban and turn their back to the streets is the concern with security and feel they must "wall" themselves from the outside. This makes the city more pedestrian unfriendly and avoids addressing any problem of safety beyond a developers own property. City Planning guidelines should not allow developments to be solely inward focused, but should address the streets and security issues should be addressed in all public areas by government.